KIDDIES BIRTHDAY PARTIES. SCHOOL EVENTS. SPORTNG EVENTS. CONCERTS. FESTIVALS. CONFERENCES. CORPORATE AND PRIVATE EVENTS. Yummy! Yummy! That's what people say about our DippyChips. They are the best quality American cut chips of medium size, fried to a crispy crunch and served with a range of delicious sauces in our special packs. These include Tomato, Cheese, Mayonnaise, Thousand Islands, Cream and Chives, Garlic, Mustard, Sweet Chilli, Mayolick, Honey Mustard and others. These have been selected only after a long tasting and selection process and great report-back from delighted customers. DippyChips is part of Longtom Foods which is famous for its footlong boerie rolls, cheese grillers, hot dogs and other fast and easy food-on-the-move. 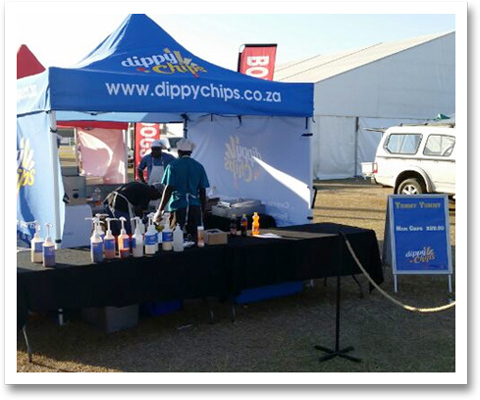 You can book a DippyChips food stand on its own or you can book Dippy Chips to accompany Longtom Foods at concerts, festivals, school and sporting events, conferences, birthday and office parties. It adds to the variety of good things to eat. Just phone Glenn at 083 301 6145 or the office at 011 783 0057. And taste the fun!